STEPHANE.AUGER – Conférencier, Chroniqueur, Consultant. Stéphane Auger has been in the refereeing business for over thirty years, including twenty in the National Hockey League. He is intimately aware of the power of the whistle on the ice. With a single blow of the whistle, the referee can put an end to a game. All the while, twenty thousand people scrutinize his every action. That’s authority! However, with such power, comes great responsibility. 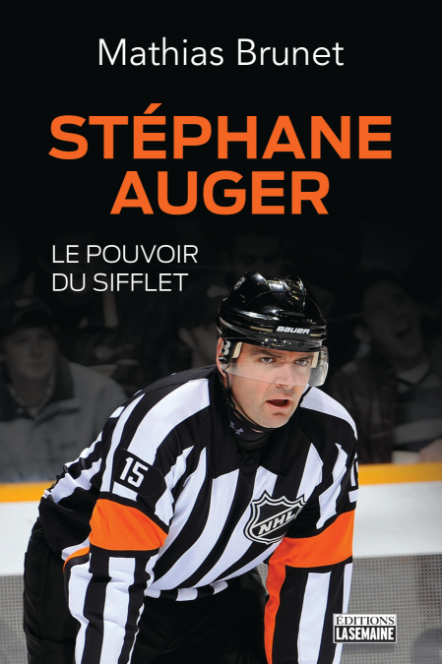 Stéphane Auger knows that the referee must be accountable for his or her decisions and be confident. The lessons he learned from the thousands of games refereed during his career are certainly applicable in everyday life. To decide is to act and to accept to face the music with courage. The type of courage leaders are recognized for. Stéphane Auger’s conferences are crafted to push certain hot buttons (raise sensitive issues / strike a few chords) and stir passions. What he shares with the audience, often with humor and with surprising images and scenes, is his experience with managing conflicts, crowds, egos and groups. A successful leader must have good judgment. What If It Was Your Child! Amateur sport raises strong passions. Unfortunately, we are far too often witnesses to the questionable behavior of certain parents in the various sporting arenas. We must never forget that our youth practice their favourite sport to have fun. Next time you heckle a young referee or player, ask yourself: What if it was my child? Intended for sports organizations, Stéphane Auger, through his experience, reflects on the current state of amateur sport and the behaviors it generates. What If It Was You! There is no better school of life than sport. It is crucial to comprehend the rules when practicing our favorite activity. Unfortunately, we far too often witness behaviors that are tolerated in the context of sport, but unacceptable in society. Would you like to be harassed, intimidated or disrespected in your everyday life? So, why accept it when practicing a sport? What If It Was You is intended for young people in a school setting or within sports organizations. A REFEREE, LIKE A LEADER, MUST BE PREPARED FOR ALL POSSIBLE SCENARIOS.
" It's the referee's fault!” How many times has Stéphane Auger heard these words during the 13 seasons he officiated in the NHL? Here, he tells his anecdotes, which have marked hockey fans over the years. Did he really threaten Alexander Burrows of the Canucks in 2000? And what happened to the stick thrown into the stands by Mats Sundin? This testimony offers you a genuine window into the world of referees, often misunderstood, but essential to the game of hockey. Today an expert commentator with TVA Sports, the former referee depended on essential qualities, such as judgment, rapid decision-making, self-confidence, impartiality, responsibility and conflict management to excel in this role of authority. And although he has since left the ice, the characteristics that made him a recognized referee still prove useful on a daily basis... and may prove useful for you too! " "It's the referee's fault!” How many times has Stéphane Auger heard these words during the 13 seasons he officiated in the NHL? Here, he tells his anecdotes, which have marked hockey fans over the years. Did he really threaten Alexander Burrows of the Canucks in 2000? And what happened to the stick thrown into the stands by Mats Sundin? This testimony offers you a genuine window into the world of referees, often misunderstood, but essential to the game of hockey. A former referee with the National Hockey League turned expert commentator with TVA Sports, Stéphane Auger is regularly invited by business communities to give conferences, in both English and French. Today, backed by extensive experience in several national and international championships and some 800 games in the NHL, he currently works as a consultant and contributes to several hockey leagues in Europe and North America.